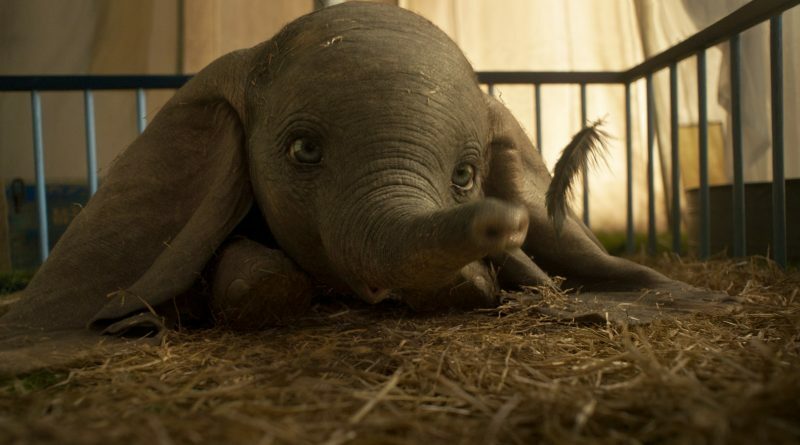 Moviegoers get to see an adorable baby elephant fly, but two-time Oscar nominee Tim Burton’s remake of “Dumbo” doesn’t soar with the simple magic of the 1941 animated classic. Since there’s not much of the original story to work with, and seasoned screenwriter Ehren Kruger (the “Transformers” movies, “The Skeleton Twins”) fills it out with a cluttered and repetitive narrative crammed with thinly drawn, one-dimensional characters. For all the dialogue about mystique, the movie fails to embrace the notion: While Dumbo doesn’t fly until the final moments of the original film, the gorgeously computer-rendered elephant calf in the new version takes off early and often, with steadily diminishing returns. Although the animal characters in the remake don’t talk, they are surrounded by humans who do plenty of yammering. Set in 1919, the film stars Colin Farrell as Holt Farrier, a former trick riding star who returns to Max Medici’s (Danny DeVito) lovably ramshackle circus from World War I without one of his arms. His ragtag circus family has been caring for his two children – aspiring scientist Milly (Nico Parker) and clumsy wannabe big-top performer Joe (Finley Hobbins) – since his wife and performing partner died in the 1918 flu epidemic while he was fighting overseas. So, the Farriers are at loose ends when Medici’s newly acquired female elephant gives birth to a big-eared baby that even some of the circus folk tease for his unusual appearance. But the Farriers lovingly care for Dumbo – especially when his mother’s attempts to protect her calf leads to disaster and the elephants’ separation – and the children are shocked with the flappy-eared animal achieves liftoff. Dumbo quickly becomes Medici’s star attraction, attracting the attention of fast-talking entertainment mogul V.A. Vandevere (Michael Keaton), who is willing to buy out the entire Medici circus in order to bring the airborne elephant to his fancy new Dreamland amusement park and team him with Parisian street-performer-turned-trapeze-star Colette Marchant (Eva Green). Unfortunately, no one involved in “Dumbo” is doing their best work, with the possible exception of the visual effects team. As with his previous Disney live-action effort, 2010’s “Alice in Wonderland,” Burton’s “Dumbo” boasts occasional magical moments but fails to cast a sustained spell. Given his reputation for wonderful weirdness, his latest trip to the circus – he ventured under the big top which much more satisfying results in his 2003 masterwork “Big Fish” – is a disappointingly nondescript outing. Burton’s frequent musical collaborator Danny Elfman makes a few welcome nods to Frank Churchill and Oliver Wallace’s Oscar-winning “Dumbo” score, and Sharon Rooney, whose majestic mermaid Miss Atlantis is one of the standouts among the mostly bland circus troupe, delivers a lovely rendition of the wrenching ballad “Baby Mine.” The production and costume designs from Oscar winner Rick Heinrichs and four-time Academy Award victor Coleen Atwood, respectively, provide colorful eye candy to go along with the cute gliding pachyderm. But “Dumbo” seems to coast on its familiar fairytale concept rather than fully taking flight.